British Plastics and Rubber magazine devotes a whole page to Mecmesin in their latest issue. They asked us to contribute to an article in a special supplement on green issues because we are experts in reducing waste. In the article on page 67 of the September issue, we explain why testing plastics not only benefits the environment but the pocket too. We describe how top-load testing, can test packaging design and integrity to see if the amount of material used in containers like PET (Polyethylene Terephthalate) can be reduced. 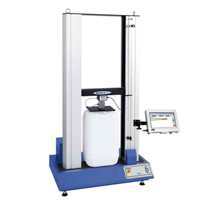 The article featured an image of our new touch-screen top load tester - the MultiTest-xt (see below).